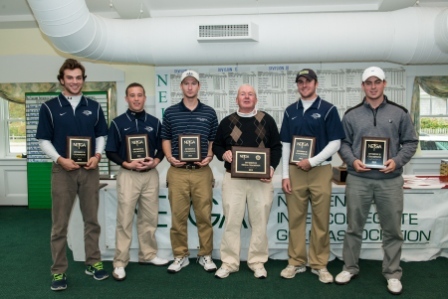 Brewster, Mass -- Teams from 35 colleges and universities across New England and New York gathered at The Captains Course in Brewster, MA, on Sunday October 28, 2012 for the 78thAnnual New England Intercollegiate Golf Championship. Due to the impending threat of Hurricane Sandy, the Championship has been shortened from 36 holes to an 18-hole event. One hundred and seventy-one golfers from Divisions I, II and III competed. The NEIGA was pleased to have Cleveland Golf / Srixon return as the ‘Presenting Sponsor”. 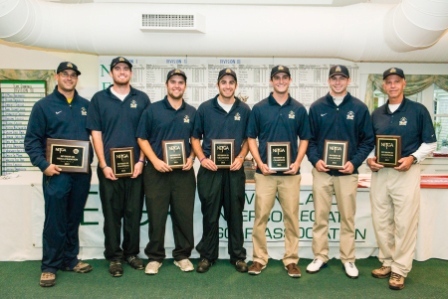 The New England Intercollegiate Golf Association (NEIGA) has been in existence since 1934 and includes 47 member colleges and universities in New England and New York and is considered to be the oldest and largest college golf tournament. It is unique in that Divisions I, II and III compete together. There was no overall champion declared as teams played on two different courses (Port and Starboard) so champions were crowned in each. 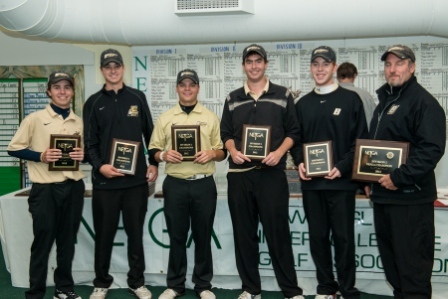 Division I Bryant University shot a 316 to defeat Providence College by one stroke. Holy Cross’ Peter Cahill parred the first playoff hole to defeat Bryant’s Kyle Buschmann. Both players shot a four-over 76 on the Port Course. 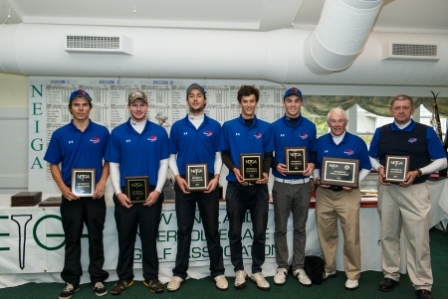 Division II crowned Co-Champions as UMass Lowell and St. Anselm tied for a tournament-low 311. 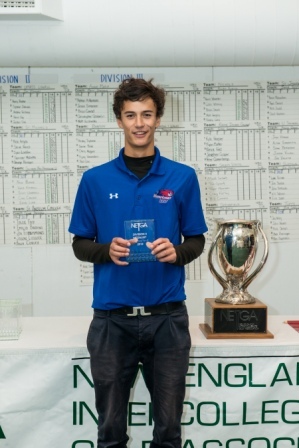 A three-way playoff for DII medalist saw UMass Lowell’s Harry Hulme defeat teammate Sylvain Debiais and Franklin Pierce’s Stewart Wise on the second playoff hole. All three tied for low score of the day (three-over 75 on the Port Course). UMass Dartmouth took home the Division III crown with a total of 312 to edge Husson University by one stroke. 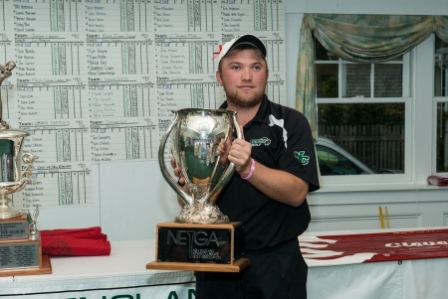 UMass just missed out on the medalist trophy as Nichols College’s Kevin Wheeler parred the first playoff hole to defeat George Gilmore. There were long drive and closest to the pin competitions on both courses. Winners of the long drive competition were Tim DiStefano of Holy Cross and Brendan Kelleher of UMass Dartmouth. Winners of the closest to the pin competitions were Michael Hanley of Providence Collegeand Pete Camerlengo from Rhode Island College. Due to the shortened championship, additional awards were given out at the ceremony following the round instead of the annual banquet. The 2012 Guy Tedesco Award recipient was Matt Michel from Bentley University. 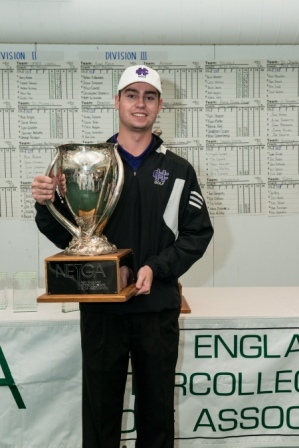 This award is given annually to the Outstanding New England College Golfer who displayed the qualities Guy Tedesco was noted for: unselfish leadership, outstanding talent, love of golf and willingness to promote positive aspects of golf to others. The Gordon McCullough Award given to the “Coaches Honoree” was presented toCoach Joe Eadie of Springfield College. Head Coach Len Roberto of Fairfield Universitywas presented the President’s Award.